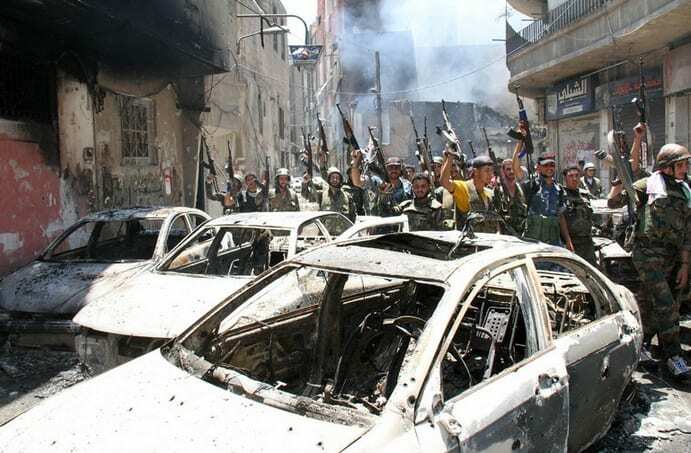 Damascus, Syria – Amongst burnt out cars Syrian soldiers fire their weapons in the air in the Midan area of Damascus. The Information Ministry organized a tour for journalists following official confirmation that the Syrian army has regained full control of the area that has seen fierce clashes between Syrian forces and armed groups over the past four days. This entry was posted on July 20th 2012 at 3:31pm/15:31 and is filed under Live News Column 1, World News. You can follow any responses to this entry through the RSS 2.0 feed.